Looking for a soft baby blanket and stuffed animal pillows for playtime? Playful Trails in Nungambakkam has that and more! This store is right next to Cupcake Company on Rutland Gate 4th road and will reel you in with its cozy ambience. It’s a cute little store filled with things to keep babies and children warm and happy! They have printed wash cloths starting INR 200 and really soft blanks starting INR 799. We might have got ourselves one. Or two! Playful Trails has a good collection of pillows in various sizes and shapes like stars and hearts. They have stuffed pillows in the shape of animals too starting INR 800. Our fave is their alphabet pillow collection, a bunch of bouncy alphabet-shaped pillows. They also sell bedding sets that have a bumper, razai, bolster, and a cushion. We found some cute Raggedy Ann style stuffed dolls that are compact and eco-friendly! There are adorable frocks, shirts, and skirts for children starting INR 500 and a bunch of stuffed bunnies that look like The Velveteen Rabbit illustrations in the book. 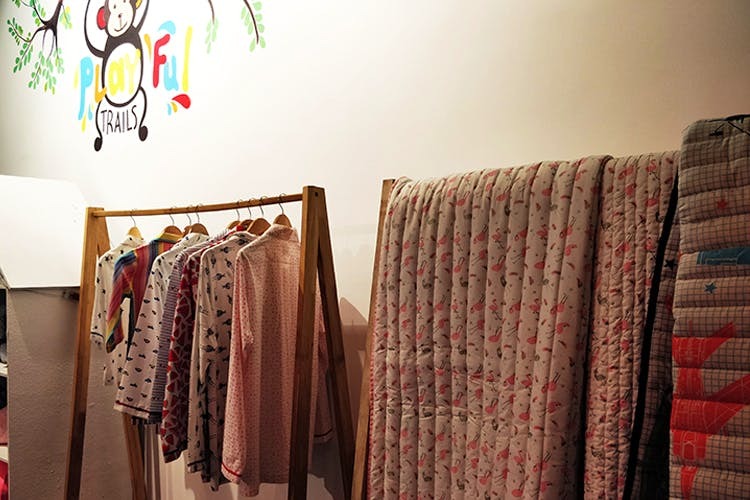 Toys, clothes, blankies, and more, Playful Trails will help keep your children comfy & cosy! That too on a budget.